Today, it seems that Cisco’s international buying spree continues. acquisition of Israeli mobile startup, Intucell, for $475 million in cash last week, the company announced this afternoon that it is acquiring Czech network security startup, Cognitive Security. The terms of the acquisition were not made public. In its announcement today, Cisco Head of Corporate Business Development Hilton Romanski said that it will be combining the startup’s realtime behavioral analytics with its own cloud-based global threat intelligence system to create a “common policy engine that controls distributed network enforcement in an intelligent network.” Essentially, the goal is to allow Cisco to provide corporations and the enterprise with the ability to better identify and mitigate advanced cyber threats. The acquisition is yet another example of the fact that Cisco is looking to make moves. The company got in the buying mood back in November, when it acquired cloud infrastructure startup, Meraki, for $1.2 billion in cash. With its subsequent purchase of Intucell for nearly $500 million, the networking tech giant has invested nearly $1.7 billion in M&A over the last quarter. And, while Cisco is well-positioned compared to its networking rivals like Alcatel-Lucent and Juniper, the space is going through a big change these days, and Cisco is trying to make the necessary preparations given the diverse nature of its investments. That led to the company’s exit from the consumer space last week, in which it sold its home networking business unit to Belkin, including the Linksys brand and products. The sale of Linksys, one of its largest consumer properties, followed its shuttering of its Flip video product line — another of Cisco’s well-known consumer brands — as the line began to suffer from the growing competition from smartphone cameras. At the time, Cisco CEO John Chambers said (via TNW) that the company was re-focusing on its four key business priorities, “core routing, switching and services, collaboration, architecture and video. Cisco’s acquisition of Meraki and Intucell both fall into the architecture and infrastructure camp (for both enterprise WiFi and mobile), however, its purchase of Cognitive Security shows that the company is continuing to reach into related sectors to protect its market-leading position. 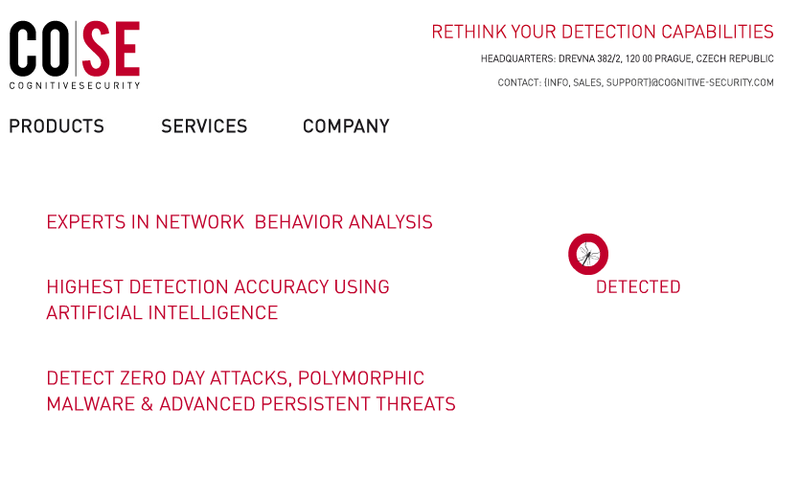 As Romanski details in the company’s announcement, since its founding back in 2010, Cognitive Security has been focused on network security research and “applying artificial intelligence techniques to detect advanced cyber threats.” The company, which now has 28 employees, set out to identify and analyze IT security threats through “advanced behavioral analysis of realtime data,” enabling businesses to more quickly and efficiently detect security anomalies. As mobility and cloud computing change the security landscape, traditional approaches are no longer sufficient to protect businesses amidst the evolution in cyber threats. Through its acquisition of the Czech security startup, Cisco will be able provide its enterprise customers with a brand of advanced security that their networks require today. As a result of the acquisition, the startup’s employees will be joining Cisco’s Security Technology Group, led by Senior Vice President Chris Young. The acquisition is expected to close in the third quarter of 2013 and is subject to approval by the company’s shareholders. Find more in Cisco’s announcement here.